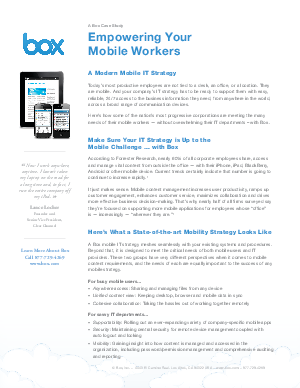 Download this whitepaper to learn how to build a mature mobile strategy and the top 4 criteria for secure collaboration. Today’s most productive employees are not tied to a desk, an office, or a location. These top producers are experts at finding new tools, new apps and new ways to integrate mobile devices into their daily workflow. Your challenge is to build an IT strategy and architecture that can support this new way of working with easy, reliable, 24/7 access to information, from anywhere in the world.